This painting took me four day. The past week, my time was fragmented for everything. 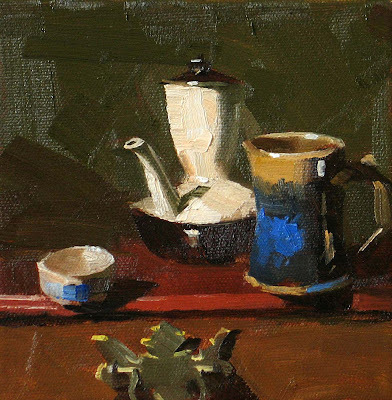 In this painting, I was attracted by the light transmitted through the brown bottle and then casting on the vase. I don't know I depicted the effect or not. Working on a painting in multiple sessions is problematic to me. Colors (especially darks) dried between my painting sessions and showing inconsistency. Does anybody know how to fix this problem? To change or not to change, that is the question. I really appreciate that so many friends writing to me about my style concerns. I think I will just let it go. Whatever will be will be. My today's painting is about Green. I haven't done much to reduce my carbon foot print yet, but I did put more green color on this painting. Well, it doesn't count, does it? We all should do something to make the world more sustainable. Oh! I got an idea: I will telecommute tomorrow..... I wish. (sigh). Do you have this kind of experience: You like one artist's work and observed his/her development. At a certain point, you see the artist's style changes to a direction that you don't quite like. You feel the artist's work is getting worse instead of better. Eventually, you delete this artist from your favorites list. This kind of thing happened to me before and I didn't know why. Now I do. After having painted so many, I start to feel that I run out thing i really want to paint. I am in this bottle neck now. I keep remind me: Qiang, do not go crazy. So, I won't. My today's painting is my typical style. I will keep this style, if you don't feel too bored. They are neither oranges nor lemons. They are beautiful small melons grown in our yard. I don't know their names. They don't taste good, but they surely have a vibrant color. With this painting, I am experimenting again. I want my paintings look more modern. 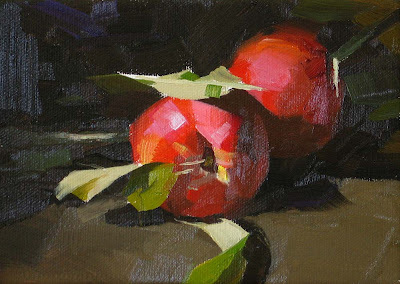 I really like one of my fellow daily painters Aaron Lifferth's work. He uses very simple designs, but gives very strong color impressions. I am sorry I was a little blue yesterday. I really appreciate so many people emailing me and providing many constructive ideas. Life goes on, and I will keep working. Recently, I have received several galleries requesting my paintings. I think I need to paint more relative larger paintings. Whatever I do, I will keep you posted. My today's painting is another demo I did at my workshop last weekend. Please enjoy. My mind was actually blank when I start to paint yesterday. Be honest with you, I am in a stage of fatigue now. 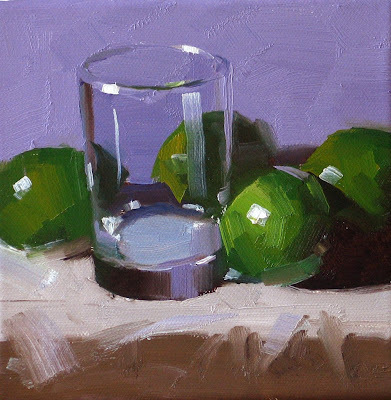 Having painting still-life for so long, I start to feel tired. I bought quite a few junks the other day on my way home. I placed some of them and painted like zombie. In my workshop, I told everybody: you must have an idea when you start to paint. Well, I lied... Oops, I shouldn't say that. OK. that is enough. Am I serious? Your call. I have just returned from teaching a workshop in Magnolia, TX. I had a wonderful time there. I enjoyed meeting new friends and seeing old friends coming back. I hope all the attendees have found this workshop useful and enjoyable. I hope to see you again in the future. I'd like to thank Marty Hatcher for organizing this workshop. Today's post is one of my demo pieces there. Please enjoy. Last night I went to the Art Center of Williamson County and did this portrait. This is my second human painting this year. I don't feel satisfied with this turning out, but it is fun to have a change. 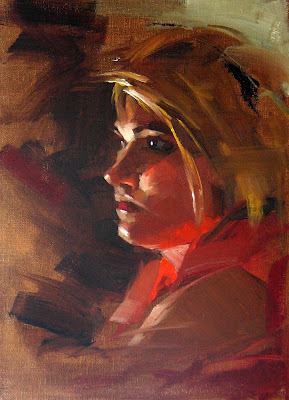 As matter of fact, I used to paint portrait and figure more than still-lifes. But I understand it will be very difficult to reach the level of professional quality with my current working conditions. I am not going to post this painting on eBay, but if you like to have it, please make me an offer. My wife got these nectarines the other day. They are so juicy and sweet. More important to me, they make such a great still life subject as well. I am so grateful that we have so many wonderful fruit for our enjoyment. I remember many years ago I met a group of friends in a meditation retreat center. They were fruitarines. They belong to an extreme group of vegan vegetarians. They only eat fruit because they think eating vegetables are cruel, because we destroy the life of the plants for our consumption. But fruit is the gift from the mother earth. There is no killing involved. We can have them with a peace of mind. Well, I respect them whole heartily, but I don't think I can do that. In any rate, this tells us how special a nectarine really is. 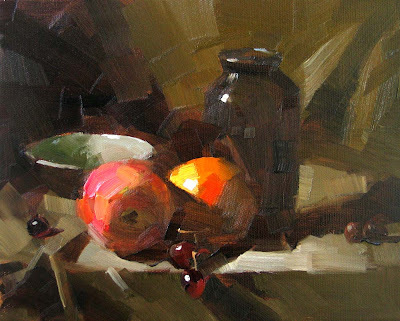 This painting is my imitation of one of Richard Schmid's paintings. I believe studying the great master's work is one of the best ways of learning. With this painting I am practicing how to paint leaves. I really like Richard's colors and edges. I am going to teach a 3-day workshop in Mexico this September. Please contact: Isabel Goode-Deblanc at isadeblanc@gmail.com for detailed information. 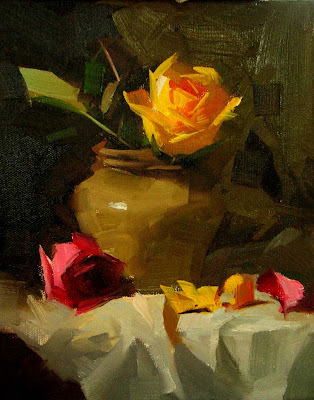 My workshop at Bastrop, TX in September has been canceled. 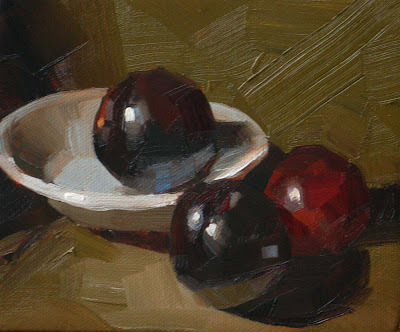 I usually do not use dark objects as the center of focus, but the texture of these plums really enticed me. The smoothness of the surface, the coolness of the highlight, the richness of the translucent colors are parts of the characteristics. 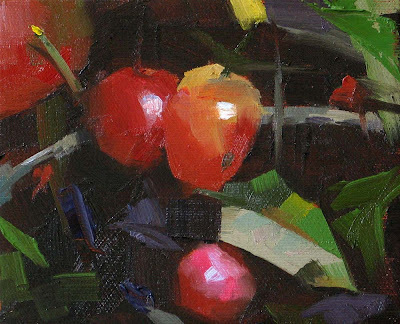 I hope the painting not only reveals the visual effects, but also let you feel the softness and taste the sweetness of these common but magnificent plums.